If some of your students think the "V" symbol in the meter means it is measuring motor voltage, they need to review the purpose and function of a shunt resistor! What will happen to the stall torque of this DC motor if the "field control" resistor value is suddenly decreased? Explain your answer. The motor's stall torque will increase. Your students will most likely have to research the meaning of the phrase ßtall torque" before they can answer this question. That is a good thing, though! Begin your discussion on this question with a survey of definitions found for this phrase. What will happen to the counter-EMF of this DC motor if the "field control" resistor value is suddenly decreased (while it is running)? In case your students have never heard the word ëxcitation" used in this context, it would be a good idea to explain it now. The electrical power used to energize a circuit in which a particular output is expected is sometimes referred to as ëxcitation." Bridge circuit power supplies are another example of an ëxcitation" source. Describe what a compound-wound DC electric motor is, and how it compares with the other motor types you've learned about so far. "Compound" electric motors have both a series and a shunt field winding, giving it a hybrid operating characteristic. This motor-start circuit reduces the amount of ïnrush" current when starting by inserting a resistance in series with the motor for a few seconds, then removing that resistance after the time delay to allow full speed operation. 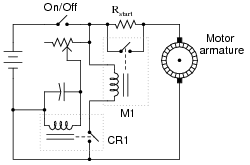 A time-delay relay provides the reduced-speed control. The relay labeled "M1" is a large "contactor" designed to shunt the motor's current around the start-up resistor. It requires at least a few amps of current through its coil to energize. The relay labeled "CR1" is a much smaller "control relay," and its turn-on time is controlled by the charging of an electrolytic capacitor. The potentiometer could be adjusted to provide less resistance, in order to hasten the switch to "full-speed" mode after startup. Challenge question: what else could be changed in this circuit to provide a shorter "reduced speed" time period? 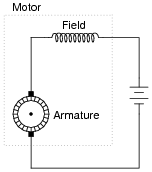 It is apparent from the schematic diagram that the motor's field winding continues to receive power when the switch is in the "brake" position. Ask the students why this is necessary for dynamic braking to work. Ask them what would happen if the field winding were de-energized as well as the armature, as the switch moved to the "brake" position. Follow-up question: what does this fact tell us about the motor's ability to operate on alternating current (AC)? There is more than one solution for the reversing problem. Discuss your students' solutions, and encourage the submission of multiple ideas! One thing you might want to mention is that the field winding of a shunt-wound DC motor like this typically draws far less current than the armature winding (especially under full load). Ask your students how this fact might influence their decision on how to re-design the switch circuit.